Technology has helped to solve many problems and is still solving more and more problems that we face in our day-to-day lives. From solving transportation, clean energy, information issues etc, technology helps us in doing business more efficiently and making it easy to do our jobs. For instance, with mobile phones, lives have changed significantly. However, technological change has its pros and cons and every situation is different based on our values. Despite this technological advancement, helping to solve economic and sometimes environmental problems, a lot is still needed to help about 2.5 billion people in the world that remain dependent on traditional biomass such as fuel wood, charcoal, agricultural waste and animal dung to meet their energy needs for cooking. According to the International Energy Agency (IEA), relying on such forms of traditional biomass result in deforestation and about 1.3million people mostly women and children – die prematurely every year because of exposure to indoor air pollution. With business as usual scenario or without new policies in place to support development and economic growth in countries facing this issue; this situation is expected to worsen since 2.5 billion people as per 2015 statistics will increase to 2.7 billion people in 2030. Reliance on traditional biomass is exacerbated due to poverty as huge populations facing this issue live in rural areas of developing countries where the main economic activity is farming. As a result, many governments and development aid agencies promote improved cook stoves to help solve this situation, but this has not come without challenges at the implementation stage because of the approach used and sometimes being a social issue that leads to none-adoption of these improved stoves. Are there technological solutions to solve over-reliance of traditional biomass? This question remains a challenge to many governments and development aid agencies because, despite there being technological solutions to the problem; this situation is complex as relies on several factors including, poverty, social and cultural issues, economics and sometimes policy issues. For instance, technological breakthroughs such as solar photovoltaic (solar PV) can help to solve this cooking problem in rural developing countries, but technology dissemination in the last decade until now proved not easy because of its high initial costs and sub-standard or low quality PV panels entered markets of some countries hence making it not easy for end-users to adopt the technology. On the other hand, the cost of implementing PV in the past has been one of the main impediments to its wider dissemination in rural communities in the developing world. As a result, development agencies used a lot of subsidies and sometimes offered technologies for free, but without a lot of success. With the case of improved cook stoves, studies show that programs that used such approaches did not succeed, because it all depends on the level of engagement. For instance, government subsidy-based delivery mechanisms with no provision of maintenance/repair leads to poor adoption rates. Also bad reputation of technology leads to low adoption or market penetration rates. Therefore, since technological solutions are already in existence, future programs targeting rural communities in the developing world could rely on ensuring the value chain of the technology being promoted is fully developed to ensure effective development, distribution, adoption and ensuring maintenance services are in existent. Lack of any channel of the value chain will result in less engagement with the end-user leading to poor adoption rates. A comprehensive study on the transfer of sustainable technologies, conducted by the Intergovernmental Panel on Climate Change (IPCC) highlighted the barriers facing institutions adopting sustainable technologies included the need for capacity building and enabling environments, stakeholder involvement, availability of appropriate technologies to be adopted and the need for effective financing and partnership building. In an era where technology has the potential to solve environmental challenges such as climate change; technological change has the potential to lower material and energy consumption if new efficient technologies are developed and adopted successfully. Specifically, in the developing world, technological solutions for reversing the effects resulting from over-reliance of traditional biomass can benefit if they are supported in policy frameworks and promoted by the private sector that will ensure good customer service is provided together with the technological solution being promoted. Private sector will get low interest loans from government or international development finance institutions to ensure wider dissemination of sustainable technologies. For instance, small businesses can be supported to create, disseminate and help end-users adopt technologies at affordable prices. 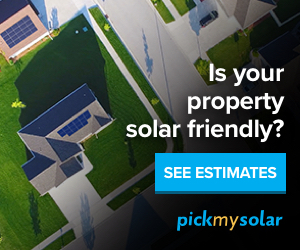 Local finance institutions can be supported to be able to provide low interest loans or other innovative financing options suitable to end-users such as leasing or solar PPA. Several programs such as M-Kopa Solar are already doing well in countries like Kenya, Tanzania and Uganda. M-Kopa Solar has connected more than 450,000 homes in Kenya, Tanzania and Uganda to solar power with over 500 new homes being added every day. M-Kopa Solar disseminate a eight (8) Watt battery solar powered system that comes with three lights, mobile phone charging and a solar powered radio. Consumers can also adopt a 20W system for watching digital TV. M-KOPA is enabling its customers to switching to solar PV and moving away from fuels that cause indoor pollution such as traditional biomass and Kerosene. According to M-KOPA, its current customers will make projected savings of US$ 300 million over the next four years and enjoy 50 million hours of kerosene-free lighting per month and create about 2,500 jobs in East Africa. M-KOPA Solar provides mainly solar lighting solutions helping to substitute kerosene and traditional biomass; although when it comes to replacing traditional biomass in cooking, there are technological solutions that utilize the solar PV technology that can help to change unsustainable production and consumptions systems that exist in many developing countries where an estimated 2.5 billion rely on traditional biomass for their cooking needs. 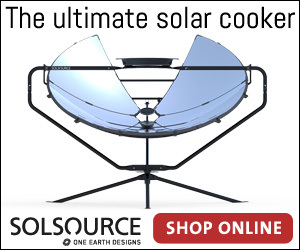 One Earth Designs that has been in existence since 2013 has developed SolSource Solar Cooker as a solution for energy poverty while working with nomads in the Himalayas. According to One Earth Designs, customers in over 60 countries are currently using this solar-powered stove which heats up five times faster than a charcoal grill and delivers a whopping 1,000 watts of power, and harness sunlight seven times more efficiently than an average photovoltaic solar panel. With such a technology, One Earth Design intends to revolutionize the way we use energy at home. Wider application of such technologies will have tremendous effect on our current production and consumption systems, especially in the developing world, where extending the national grid prove to be expensive and inaccessible to huge populations in rural areas who rely on traditional biomass for their cooking needs. As such, solar PV has a huge potential to solve some of the problems, including climate change, deforestation, energy access and indoor air pollution.